Turn Chick-fil-A’s summer drink into a frozen treat! You can just feel it — summertime is in the air. School is wrapping up, and the days are getting longer. Warmer weather also means it’s time to enjoy cool treats, like our new Watermelon Mint Lemonade. It combines a Chick-fil-A favorite, our Fresh-Squeezed Lemonade, with a summertime favorite: watermelon (and mint flavor for an extra twist)! But sipping this beverage out of a straw isn’t the only way to savor this seasonal treat. This frozen recipe is perfect for your next cookout or to simply beat the heat. It’s so simple, your kids can even help make them. Grab 3 ice cube trays and some sturdy plastic straws. Set aside. Chop watermelon into 2-inch cubes and stick a straw in the center of each cube. Set aside. Carefully pour two tablespoons of Watermelon Mint Lemonade into each ice cube mold. Place the watermelon pieces in the center of each ice cube mold and put it in the freezer for at least four hours or overnight. 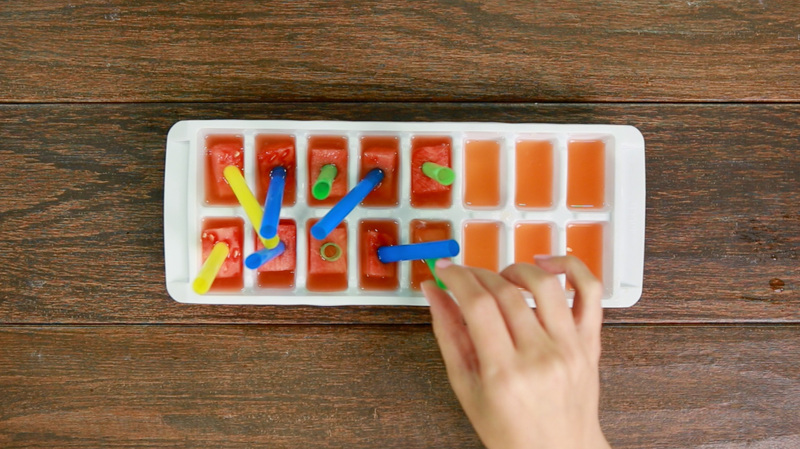 Once the liquid is frozen in the trays, remove from the freezer and twist the ice cube tray until the individual mini-popsicles are released from their molds. You can also dip the bottom of the tray in warm water to loosen the popsicles if they are being stubborn. Pull the pops out of the molds and enjoy! It’s a sweet summertime dilemma: You’ve been tasked to make dessert for the next potluck barbecue, but you don’t want to bring the same-old. Why not try something new and refreshing that kids and adults will like? Cue the slushy. Slushies date back to the 1950s when a soda fountain broke down in a popular Kansas ice cream shop. The shop owner was forced to put his sodas in the freezer to stay cool, and the icy beverages became what we know now as slushies. Depending on where you live, summer is either winding down or in full swing. Whether you’re looking for a back-to-school surprise or a sweet drink to enjoy poolside, we’ve got three simple – and we mean simple! – recipes to add a little something extra to Chick-fil-A’s Lemonade.